I received this set of Sheet Suspenders to test out . I will say 'THANK YOU " to Suspenders USA for making these available. We have had the worst time keeping sheets on our new mattress, all I can come up with is the material over lay on the mattress pad is causing this. But the most annoying thing for me is to wake up in the middle of the night or morning and find the bottom sheets every where but on the bed ! At first I thought it was me, but every set I tried did the same thing. 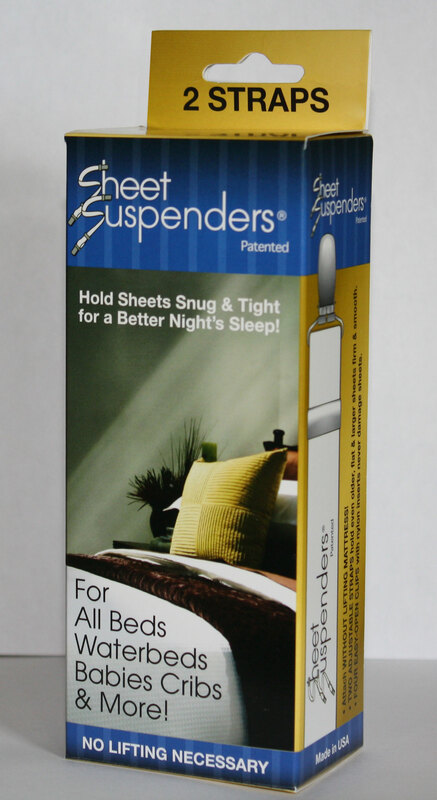 With these sheet suspenders no more sheets coming off. I put them on , it is easy to do. But I found it much easier to have another person help me and just lift the side of the mattress up and go over to the other side. We have a king size bed and these fit perfect for us with the elastic, I would highly recommend these for anyone dealing with sheets not staying in place and for the kids bed. It also helped to keep the sheets nice and tight and wrinkle free ! I received one or more of the products mentioned above for free using Tomoson.com. Regardless, all reviews and opinions are my own. I am disclosing this in accordance with the Federal Trade Commissions 16 CFR, Part 255 Guides.